In 1908/9 West Ham Fire Brigade made the momentous decision to move from horse power to the internal combustion engine. Wanstead Flats it turned out played a key role in testing the new appliance. The Council’s Watch Committee placed an order for a new fire tender with Lloyd & Plaister of Wood Green. They were one of many small motor manufacturers then based in London in the early stages of motor production. London at that time was still a great manufacturing centre as well as the world’s largest port, and biggest financial/banking centre. There were many factories producing manufactured goods. The new tender had the registration mark AN 898. At the beginning of this year, the Watch Committee of the Borough of West Ham awarded a contract to Lloyd and Plaister, Ltd., of Wood Green, for a motor vehicle which in all respects should fulfil the usual fire brigade requirements, and which should be capable of transporting a full-sized escape, five men, and a quantity of hose, stand-pipes, and other equipment at a speed of 15 m.p.h. on the flat, and 5 m.p.h. up any hill in West Ham. We are not familiar with anything that can properly he called a hill in any part of West Ham, but it is a fact that the new machine will .safely and comfortably travel out the flat at 30 m.p.h., whilst it can do all that is necessary in the matter of hill climbing. On test, it has been stopped and started on a gradient of 1 in S. near Muswell Hill. 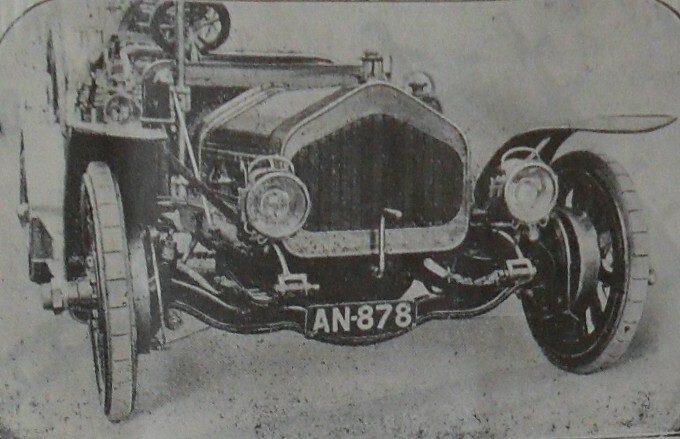 Other characteristics of this new machine, which became evident &firing the test-run, were the comfortable springing of the chassis, the smoothness with which the " L. and P." clutch picked up its work, and the ease with which it was possible to steer a machine of such unusual dimensions ; at the full speed, a perfectly-straight, over poor roads on Wanstead Flats, was maintainable while the steering wheel was only held between one finger and a thumb. The exceptionally-wide track, the long wheelbase, the low centre of gravity of the chassis, the inclined stub axles, and the excellent design of the steering gear all make for results such as this. It is important to note that the application of the front brakes does not in any way interfere with the movement of the steering wheel. Anyone who has ridden on a horsed escape-cart, at full gallop, will have noticed, not, perhaps, without a tremor of anxiety, the manner in which the escape will, on occasion, swing from side to side ; not so, however, with a well-designed motor-escape equipment, for its progress is quite steady, and free from objectionable swaying, even while travelling over an open space like Wanstead Flats when a high wind is blowing. The braking and steering gear of a motor fire-engine must, of necessity, be entirely above suspicion, on account of the machine's considerable weight and its frequent high speed in congested thoroughfares. The gross weight of the West Ham motor is 3 tons, 6 cwt., 3 qrs., and of this the escape itself weighs 11 cwt. This escape-wagon is a thoroughly workmanlike job, and it has the appearance of having been designed and built throughout for fire-brigade requirements. 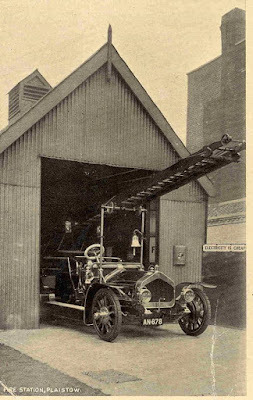 The machine was placed in service at the long disappeared sub fire station in Balaam Street, Plaistow and its photograph has appeared in a number of local history books and websites (see here). Lloyd & Plaister soon disappeared as a motor manufacturer though Southgate ordered a fire engine from them a couple of years after West Ham. Dennis and Leyland started to dominate the fire engine market. Dennis started small as a London based manufacturer of bicycles and lawn mowers! 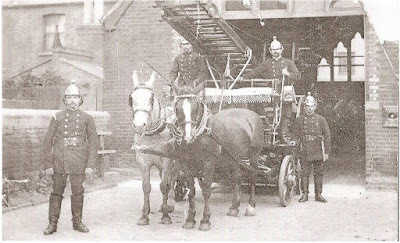 The author local historian Peter Williams is working on a history of West Ham Fire Brigade. This is the third summary of the Food Standards Agency (FSA) cleanliness ratings for Forest Gate food shops; for others, 2014 and 2015, see here and here. There are more stores covered in this survey than in the previous ones, because more have opened and the FSA have been more diligent at tracking them down for assessment (29 were surveyed in 2014, 74 in 2015 and 104 in the current survey). We have been a bit more restrictive in the types of shops we have included this time. So, although news agencies, post offices and chemists are included in the FSA listings, we have omitted them from this year's survey - as selling food is not their main function. With these changes and caveats in mind, caution should be exercised in making sweeping comparisons of overall performance across the three surveys. Overall, however, the headline would be that standards in food shops locally appear to be improving. For example, the 2017 survey recorded 53% of local food shops receiving four (good) or five (very good) stars for food hygiene. The equivalent figure in 2014 was 28% and in 2015 46%. Part of the explanation for the apparent overall improvement in performance between the surveys is that most of the dreadful shops from previous surveys have subsequently closed - with customers presumably adding a thumbs down to their standards, matching that of the assessors. One exception to this trend, however, seems to be the awful Wenty's Tropical Foods, of Upton Lane. It managed the difficult task of worsening its 1 star (major improvement necessary) rating in 2014 to zero stars (urgent improvement necessary) three years later. Can it get any lower? Can it survive? Will it be closed down sometime soon? Watch this space - for the next survey! The second major explanation for the overall apparent upward trend in results is the pleasingly high (14 shops) number of premises which have seen a significant improvement in overall hygiene - up by two or more stars, compared with the relatively small number (5 shops) that have experienced a downward drift of similar proportions. See lists of plaudits and custard pies below. The FSA use detailed criteria in making their overall assessment, and summaries can be found here. For simplicity, we have applied a shorthand, and indicate it in the sub-heads below. A word on the dates, below. The date immediately following the address of each entry is the date of the last FSA inspection. The dates and ratings below that are the stars recorded in previous surveys covered by this blog.